Herdade da Mingorra produces this Terras d'Uva Rosé 2017 (£3.74), a rosé wine from the region of Alentejo that is made of aragonêz of 2017 and has an alcoholic content of 12%. At Uvinum, this rosé wine scores an average rate of 4 of 5 points. - Nose: aroma of blackcurrant and jam. - Mouth: fresh and balanced on the palate. PREPARATION: maceration pre short fermentation, followed by fermentation at low temperature (11 °C). 14,5 pts Vinho Grandes Escolhas - Deep pink colour, blackcurrant and jammy aroma, fresh and balanced on the palate. Deep pink colour, blackcurrant and jammy aroma, fresh and balanced on the palate. 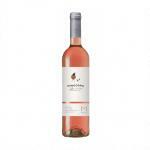 If you want to buy Terras d'Uva Rosé 2017, at Uvinum you will find the best prices for Alentejo rosé wine. Get it at Uvinum, in a 100% secure and easy process. We have more than 59.000 products for sale in our catalog becoming this way the biggest company to sell wine, beer, and spirits online in Europe with more than 38.000 customers who trust us.